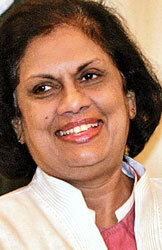 Former President Chandrika Bandaranaike Kumaratunga has accepted an invitation to join the eminent international Council of Patrons of the Asian University for Women (AUW) in Chittagong, Bangladesh. The University, which is the product of east-west foundational partnerships (Bill and Melinda Gates Foundation, Open Society Foundation, IKEA Foundation etc) and regional cooperation, serves extraordinarily talented women from 15 countries across Asia and the Middle East, including Sri Lanka. The university provides them with a pathway to service-oriented leadership via an internationally recognised liberal arts undergraduate programme. Students at the university represent a range of backgrounds and many are the first in their family to attend university. This is made possible due to the university’s commitment to empower young women with potential, bolstered by the support of strong scholarships where merited. Since AUW’s founding in 2008, 53 Sri Lankans have graduated from the university and 10 currently attend. As of 2016 a Sri Lankan member of the first group of graduates (Class of 2013) from the university has now become the first AUW alumna to complete a Masters in Public Policy at Oxford University. Meanwhile, others contribute in roles at leading organisations such as UNDP/UNV, World Vision, Good Neighbors International, American Corner Kandy, Asiri Group, Center for Environmental Justice and others. Efforts are currently underway to expand Sri Lankan student representation, build national networks of support and strengthen regional ties amongst Asian and Middle Eastern countries. As of February 2017, the university’s Vice-Chancellor is Professor Nirmala Rao (OBE), the former Pro-Director at the School of Oriental and African Studies (SOAS), UK. In 2015 the university launched its Pathways for Promise initiative welcoming young women from garment factories and from refugee populations to attend a pre-undergraduate programme with hopes of then pursuing a bachelor’s degree at AUW. This is currently done with the support of apparel manufacturers in Bangladesh and the Open Society Foundation. As a member of the AUW Council of Patrons, former President Kumaratunga will be in the company of other members including Bangladesh Prime Minister Sheikh Hasina, First Lady of Japan Akie Abe, UNESCO Director General Irina Bokova, the Grand Duchess Maria Teresa of Luxembourg, former Chief Secretary of Hong Kong Anson Chan, former Italian Foreign Minister Emma Bonino, and former Danish Environment Minister Lone Dybkjaer. As the daughter of the world’s first woman prime minister and herself the first woman President of Sri Lanka, with decades of experience in challenging barriers facing women and working to foster an inclusive and pluralistic society in Sri Lanka and beyond, President Kumaratunga’s involvement with the university will enhance regional participation for Sri Lanka’s young women. Kumaratunga takes on this role alongside her ongoing leadership of the Office for National Unity and Reconciliation, the South Asian Policy and Research Institute, and her role as Co-Chair of the Shared Societies Project for the Club de Madrid (the largest forum for former international heads of state and government that supports strengthening of democratic institutions). Sri Lankan alumnae of the university come from all across the country (Jaffna, Vavuniya, Trincomalee, Matale, Kalutara, Colombo, Galle). Through their sisterhood built at AUW, they work across distinctions of nationality, ethnicity and religion, in strongly synergized partnerships with great value and potential for Sri Lanka on the local front and on the international stage. Menusha G, of Matale is a Public Health Graduate of AUW. While at the university she was selected to attend the Harvard Project for Asian and International Relations Conference 2013 in Dubai. On returning to Sri Lanka she worked as the Project Coordinator for the Decent Labour Work programme funded by Swiss Labour Assistance. She is currently the Programme Coordinator for the American Corner, Kandy. Crystal F., from Kalutara, is currently a Junior Officer with World Vision in Sri Lanka. She is completing a Diploma in National Reconciliation and Peace building. Anushani A. is from Jaffna and was specially focused on regional (Asian) studies and gender studies.While at AUW she interned with the Centre for Performing Arts Jaffna. In 2015 she received a Fulbright Commission grant to attend The Changing Faces Women’s Leadership Seminar in Hawaii. While there she interned with the Domestic Violence Action Centre Hawaii. Using her research consultancy experience (including at ICES) and translation skills she began volunteering with Vallami (Empower) and Women’s Action Network in 2015. Chathuri W. of Kalutara is an Environmental Science major who will graduate in 2018. In summer 2016 she was selected to work at Li & Fung, Hong Kong as a Corporate Communications Intern in their Sustainability Department. She also participated in the Asia Institute for Political Economy, Hong Kong. She previously interned at the Harvard alumna run NGO Work for Better Bangladesh in Dhaka. Shynuga T of Vavuniya is in her final year at AUW, completing her B.A. in Public Health with minors in Biological Science and Environmental Science. She is an AUW IKEA Foundation scholarship recipient. She is currently completing her thesis on Drinking water quality and the prevalence of Chronic Kidney Disease of unknown etiology in Vavuniya (her home district). She hopes to pursue a Masters in Environmental Epidemiology upon graduation. She was selected to attend the International Conference on Public Health held in Colombo in July 2016. Abiramy S. of Jaffna/Trincomalee graduated in 2014. While at AUW she was selected to be human rights intern at the Olivetti Foundation in Italy and complete a summer program at the Hague. She is following a Masters of uman Rights at Colombo University and is a Programme Manager at Good Neighbors International. She previously worked with Save the Children and ICRC Sri Lanka.